Happy Black Friday! Carey here to talk more about our Autumnal Traditions before we jump full swing into Christmas! I've enjoyed all the inspiration this week and hope you've been getting some great ideas to document your autumn traditions. Of course a big autumn tradition is Thanksgiving and all of the yummy food and fellowship that comes with it! But our traditions include not only the things we do, but also the things and people we see routinely this time of the year. I love this time of year - a time of change, where the air is cool but the earth is warm, the sunlight glows lovely orange as the days shorten, the boots and sweaters come out, and our slow cookers become our new best friends. 1. Take photos of the same thing during the same time of year and see how they change from year to year. I try to take a photo of my house from the same vantage point throughout the seasons and the years. The last several years I've taken a self portrait (using a timer) of our little family gathered around the table for Thanksgiving lunch. It's fun to see not only how we've changed, but also how the food and decor on the table has changed. 2. Photograph and write about the things you look forward to seeing that only appear this time of year. 3. Document what sights signal a change in the season: warmer clothes, changing colors, shorter days, soups and comfort food, fall decor. Do you change the decor around your home during autumn? Has it changed over the years? 4. What are the sounds unique to fall? Gusty winds, rustling leaves, crunching acorns underfoot, and even leaf blowers all signal fall to me. I love to hear the sounds popping and crunching beneath my feet. 5. Don't forget about the smells of fall: the earthy smell of dry leaves, and of course, pumpkin spice everything! For those of you braving the stores today, happy shopping! If you're not, I hope you get some time for crafty fun and document some of your autumnal traditions. Sometimes I get a strange look when I tell people this, but I’m sticking by it:Thanksgiving is my favorite holiday. I love it because it's really, at its heart, about simplicity and love. There aren't any gifts to buy or worry about. There are no expectations. It's just about hanging out with your family, eating really good food. As I love to cook and I love my family, well: I love Thanksgiving! Plus, it's a holiday that's rich in traditions. When I am cooking, I feel like I am using the wisdom of many of the women who came before me—my grandmothers, my aunts, my mother-in-law, and my mom. I use the same recipes every year, some that came from friends, some that were discovered when my grandma was a young mom, some passed to me by my husband's family. (Plus, OK, a couple from Pinterest!) I like to cook in solitude, while my kids do some serious Thanksgiving hanging out (accompanied by more food, cheeseball and crackers, homemade cookies, something delicious to drink) but I'm never alone because each thing I make connects me to someone. But it's not just the food that is full of memories. If you're an American celebrating Thanksgiving today (or you're reading this on your cell phone on Friday morning while you're out shopping! ), here's a list of journaling prompts (and a few layouts illustrating them) to help you record your Thanksgiving traditions. 2. The activities. Are you a board-game-playing family? Cards? Or is it all football, all the time? What do you do between the meal and dessert? Do you go out shopping or wait until Friday? 3. The food. How do you cook your turkey? Where did that recipe for sweet potatoes come from? Who helps you cook? How long did your prep take? What is each family member’s favorite dish? What other stories can you tell about your food? 4. The little details. What small details will you always remember? What little things happened that set this Thanksgiving apart from all the others? What did you laugh about or discuss? What political or social events influenced your conversations? Or, what sensory details are strongly embedded in your memories? Scents are a huge part of Thanksgiving, and taste of course, but what does it sound like? 5. The family and friends. Who came this year? How has your family changed since last year? What qualities in each person are you grateful for? Who didn't come that you missed? How are the family dynamics at a big gathering? 6. The interaction.​ What funny things happened? What good memories were shared or conversations had? How did cousins get along (or not)? What sweet, surprising, or memorable interactions did you notice? 7. The changes. How have your Thanksgiving traditions changed over the years? What has been lost and what has been added? How are your kids' Thanksgivings different than those of your childhood? 8. The setting. Whose house did you eat at? If you ate at yours, what preparations did you do to get your house ready? At someone else's, what do you love about that place? How does the location influence your Thanksgiving experience? 9. The desserts. (As much as Thanksgiving is about turkey, potatoes, stuffing, and rolls, it's equally involved with dessert, yes?) What is each person's favorite dessert? What dessert must be present or it wouldn't feel like Thanksgiving? Who makes the desserts? (Or did you buy them all at Costco?) Whipped cream or ice cream? Cake or pie? 10. The feels.​ Gratitude, of course, goes hand in hand with Thanksgiving. So it's an important emotion. But it's not the only one. What other emotions do you experience at Thanksgiving? Are you emotions straightforward or complicated, and why? Were you surprised by anything you felt this year? I hope you have a wonderful Thanksgiving. May your turkey be moist, your mashed potatoes buttery, and your pie crust flaky! Hello! Welcome to the Wednesday before Thanksgiving. If you're anything like me, you'll be cooking quite a bit today. 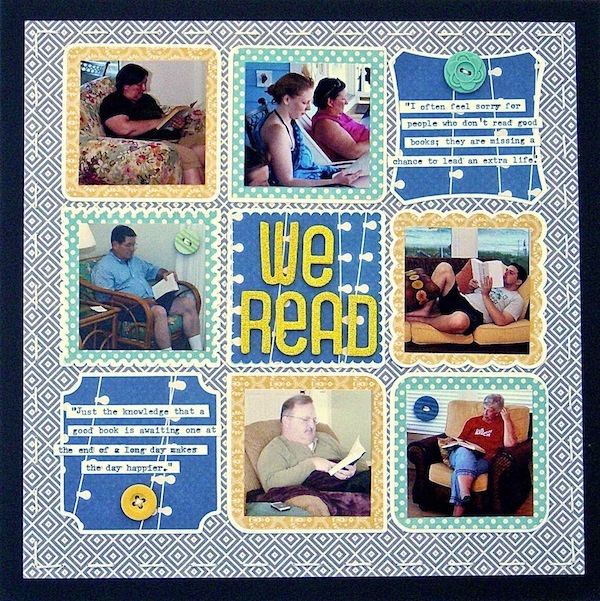 But maybe you'll have some time for scrapbooking, too, and maybe this idea will help you find an embellishment or two. But also because it just looked so pretty! So here's a little challenge: take a break from cooking to wander around your house for a few minutes, looking for inspiration in your home decor. Maybe even take a few notes for ideas you want to use soon. Then put them to use and share them! And let me wish you a very Happy Thanksgiving, if you're American. It's my favorite holiday, so tomorrow I'll be reveling in gravy and rolls and stuff and of course pie! Today is day two of our preparations for our Thanksgiving project. 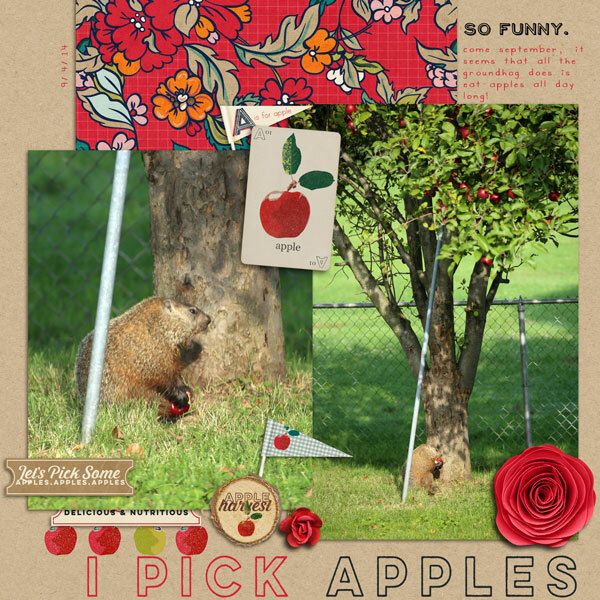 In case you missed yesterday's post, we are planning a project (page or mini) based upon's Sue's gallery layout this month. We are going to check in on our holiday hour by hour to see what we are doing. This is in part because I loved the idea, and in part because last year was an epic fail in the photo department! I figure that most of these will be covered as I go hour by hour. I am setting a timer on my phone to remind me that an hour has passed. I know all too well that once a turkey is in and rolls are rising and I start in on the sides that I will forget the photos. Hopefully a beeping alarm will help. I am also planning on telling my kids so they will help remind me. I think that being purposeful is already going to increase my chances of a successful photographic event. Any thoughts for maximizing succcess? I am all ears! Hello! and welcome to Thanksgiving week. I am so excited to work together to put an album or page together. I think it's going to be plenty of fun. Did you see Sue's post from earlier this month? I did and I loved the idea. I am going to copy it for out Thanksgiving day. You might remember that last year I totally forgot to take any photos. So busy cooking was I. This year, I don't want to repeat that mistake so I thought I might preplan a page/album. I'm not toally sure how I want to put it together, but I know I want to follow Sue's format of documenting hour by hour. To help me with the journaling, I have put together journaling tags that list the hour. I will let the photos guide the stories, and add notes that coincide with the times. I'm so excited. Here are the tags. I made them a bit generic so that I might reuse them for another project/holiday. If you would like to download them, you may do so here. I hope that you might use them to put together your own Thanksgiving project! Hi everyone, Diane here today sharing some thoughts on Thanksgiving. While I have been out and about the last couple weeks, I have noticed that we have gone straight from Halloween to Christmas in the retail world. Don't get me wrong, I LOVE Christmas...the decorating, Christmas trees and lights, favorite Christmas movies and music, snuggling up inside with the fireplace on sipping hot cocoa, and spending time with the family and friends. But, I feel I should pause before heading straight into all of that and think about everything I am thankful for this year. As I started planning the Thanksgiving meal for my family, I thought perhaps I should create some Thanksgiving place settings too. So, I pulled out my scrapbooking supplies and came up with some quick and easy tags and name cards to make the meal with my loved ones just a little more special. To create the Thanksgiving tags, I simply added a piece of fall flair, a greeting and a strip of gold glitter to office tags and tied it onto the napkin ring with cream and gold twine. For the name cards, I used woodgrain textured cardstock trimmed in gold with cream and gold alpha stickers for our names. These were quick and easy and really adds a special touch to the table. I'm looking forward to sitting down to this with my family next week. Thank you for joining me today. May you be blessed this holiday season! It is the first of the month and we couldn't be more excited! This month we are all about making use of what you have. Shopping your stash. Reduce/reuse/recycling all those piles of paper and all those drawers of embellishments. To get us started, our team created an entire gallery with scraps they had lying around. They weren't allowed to use anything new or whole (except a background paper, of course!). They did an amazing job! The layouts are hip, fresh, current, and well designed. A reminder that we have lots to work with even if we haven't shopped lately! Let's go look, shall we? 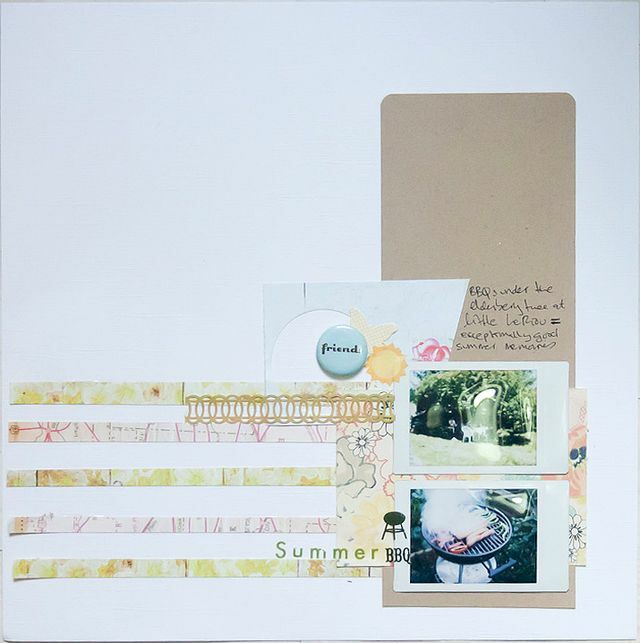 Don't forget you may always click over to the gallery album to read the journaling and see the layouts in a larger format! Enjoy!! You know that time of the month…When you have used your favorites from your monthly kit, another kit is not due to arrive for a few weeks, and all you have left is dozens and dozens of older supplies that are sitting in your crafting area. It is not the easiest time to scrap, but it gets some older products used, and flexes those creative muscles. I work at a preschool, and every October I have to give a presentation to the parents. It’s always good, but it sure does get my nerves going! The scraps may be hard to see—I wanted a neutral background with mixed papers, so I dug into my scraps bin and found these three pieces. I layered them and taped the back of the page to create the foundation for the page. My eleven-year-old is almost as tall as I am. I’m 5’9”. Yikes! 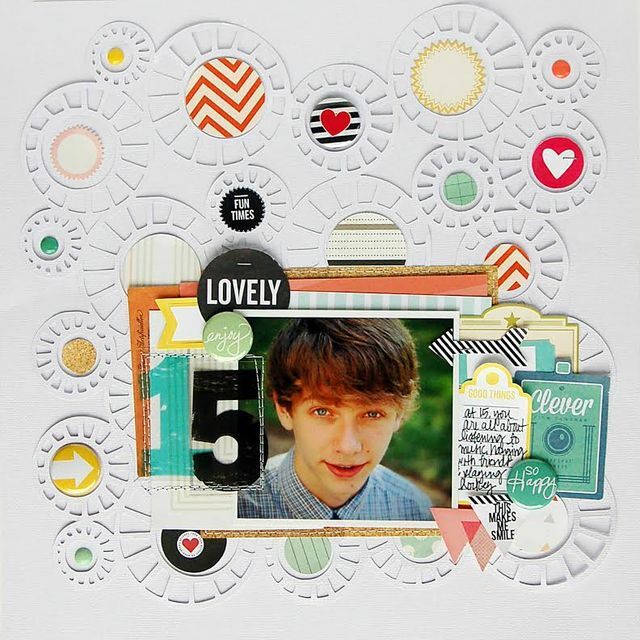 On this layout I have used the easiest way to use up scrap paper; punching circles from them. Super simple and it makes a big impact! I am addicted to pumpkins. Yep, totally need to buy a lot of pumpkins! 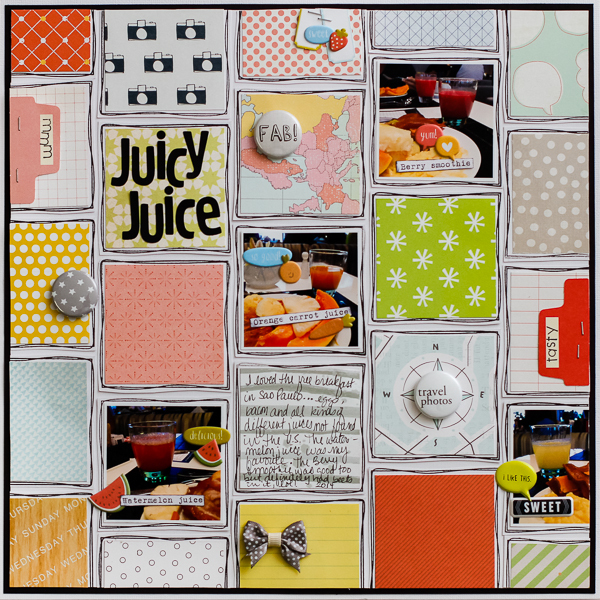 This layout was created with leftover strips of patterned paper die cut into a 9-square grid. Then it was just a matter of filling in the shapes! This month our granddaughter will be 6 months old. She is an incredible joy and delight! One of my favorite sources for scraps is what I think of as paper selvage. You know...that .5"x12" strip you cut off your patterned paper? If they have any print on them at all (almost all of them do now), I save them. Quite often, I'll use the selvage on the same layout I use the patterned paper it came from...but not always. I keep them in a tall, skinny vase I bought at an antique store one day. Sometimes one of those strips is just the right little thing! For this layout, I sorted through all of the strips I have and used the ones with coordinating colors. I opted for a black and white photo to make the image stand out from all the different patterns. My fitness goal this month is to start lifting weights again, four times a week. 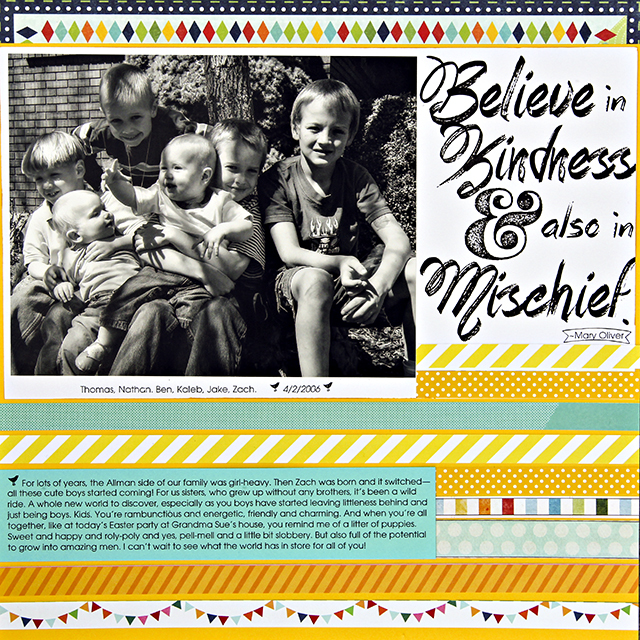 This layout was made using the scrap patterned paper left overs from the organizer I featured on write. click. scrapbook. last month. This is my favorite month of the year (well, tied with December). Bring on pumpkin everything! I have had this digital kit for about a month, but I had only made one page with it so far. I acquired it just around the time I took these pictures so I precisely knew what I wanted to scrap with it. Like every year, this is the time I put together our annual calendars that we give as Christmas gifts to our parents. I usually gather the favorite pictures taken over the past year, but a photo shoot is often required to get the missing few shots. Inspired by this month's topic "Happy Scraps" I chose a rainbow color scheme and photos that made me feel happy for my page. 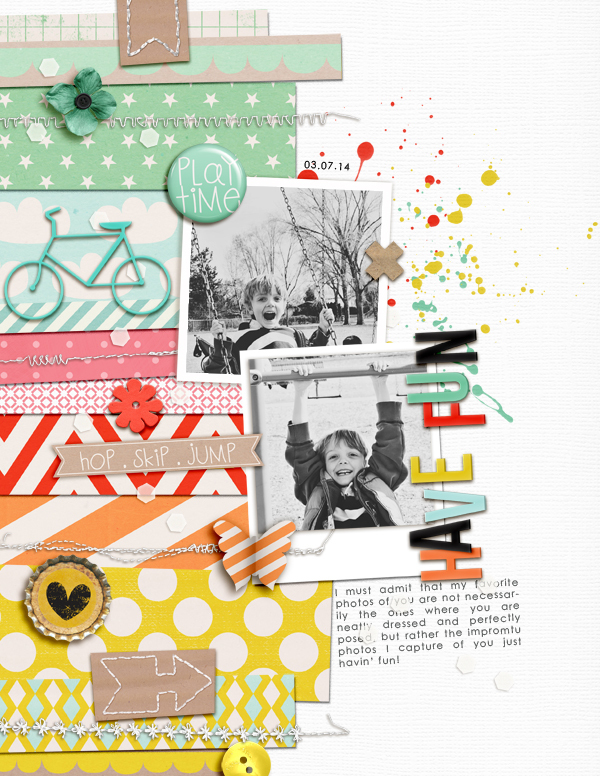 Then I used this foundation of patterned paper strips and sprinkled random little bits to recreate the look of "scraps" on my digital page. October is my absolute favorite month of the year. Bring on the corn mazes, pumpkin chocolate chip cookies and Halloween costume making! 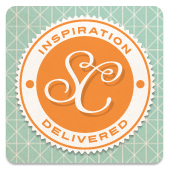 I used little bits of digital patterned paper in the same manner I would normally use scraps. Layering up little pieces gives the grouping more weight and the jagged edges create energy. My boys are just not into being in front of the camera lately. This is where having a teenage niece comes in handy. She’s selfie and photo obsessed! I love it. I loved having a good reason to dig through my scrap drawer and use some up for the gallery this month. I got out a square punch then cut the squares down into triangles. I played around with the pattern until I found something I liked. I stitched down the middle of each column of triangles and them pulled up the edges for some dimension. I've been using the same DSLR, a Nikon D50, for eight years now. I'd love to upgrade, but if it's not broke, don't fix it. Right? Every year I do a layout for each child about their favorites at the moment. This is about my boy at 15. As much as I enjoyed our summer, I am so excited to get back into a routine this month and enjoy the fall weather. 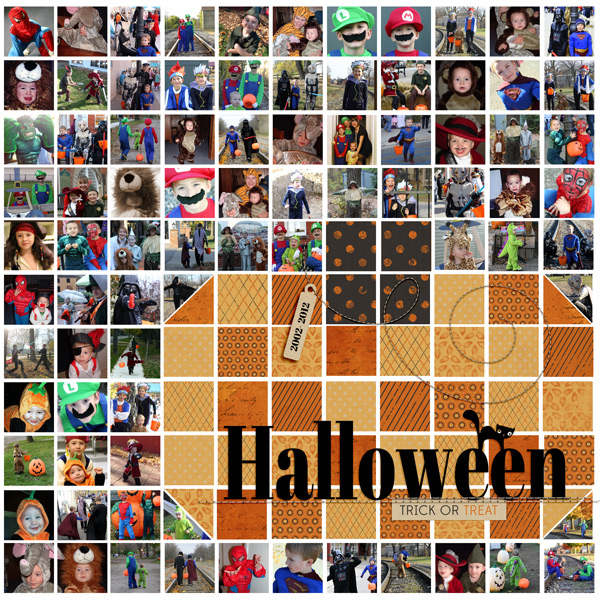 This layout is a look at 10 years of Halloween memories! Digital templates make putting together years of memories a cinch! Small photos can be used with a template, printed individually, or you can use up all of those small index photos you have lying around! Small scraps of paper can be cut up and pieced together to create the pumpkin (or really any shape you want! )It is a fun touch to make the layout scream Halloween! This year we have made a list of 10 fall activities we want to accomplish this month! Our calendar is jam packed, but the fall always goes so fast and we want to fit in as much fun as possible before the busy holiday season is upon us!! I love trolling through old kits to see what I haven't used in awhile. I have a few that are archived, but I am pretty frugal so I have most still accessible. Even still, it seems I reach for the same handful over and over. It was fun to push myself to find things I haven't used in a long while. I already have Halloween decorations up! This year we get add in the poseable skeleton we got at season's end last yea! I can't wait! It was fun digging through my box of scraps and finding bits and pieces for this page. I should do that more often! I haven't bought new scrapping supplies in over a year. And yet I still find tons of stuff to use on my pages. Fancy that! Hi there! I'm Amy Kingsford and I'm excited to be here Thanksgiving Week sharing creative ways to express, reflect on and celebrate gratitude. 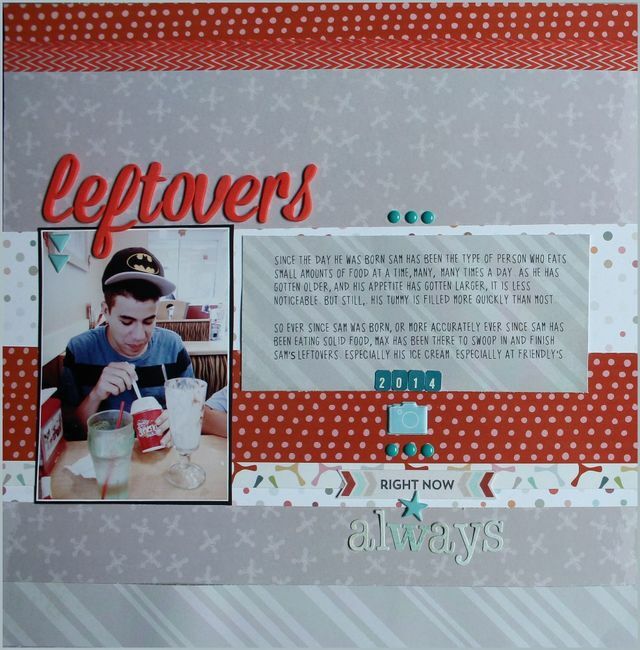 As a scrapbooker, I get to relive some of my most cherished memories as I retell their stories in my pages. And as I sit down to record these memories, I hold the photographic evidence in my hands of so many of the things I have to be grateful for including a wonderful and supportive husband and two beautiful boys who fill my life with love and laughter. 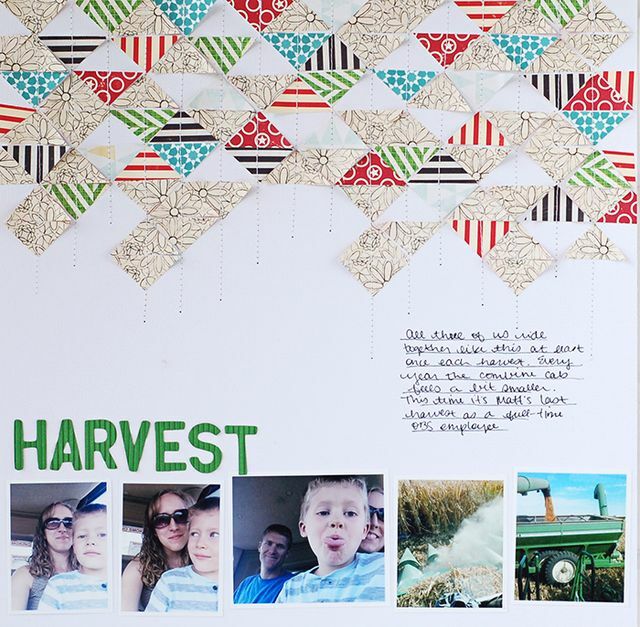 What are you grateful for...and how do you celebrate your gratitude in your scrapbook pages? Thanksgiving can be the perfect time to reflect on your gratitude in your pages...after all that is the spirit of the holiday, right?! In Jennifer Larson's page, "Thankful 2011" she's commemorated their 2011Thanksgiving with a photo of her family at their annual Turkey Day 5K and listed what each of her family members was thankful for. And though Laura O'Donnell's page "Thanksgiving 2010" may appear to be more about Thanksgiving, its story is definitely one of gratitude. Francine Clouden recorded a short but thoughtful list of personal gratitudes on her page "Thankful." In my page "Thankful For You," there was just something about this photo of my brother and sister-in-law and the way they were looking at one another that just spoke volumes of gratitude. Not just a look of love but something even deeper. In Sue Althouse's page "He Folds His Socks..." she expresses gratitude to her husband for the little things he does that she doesn't like to do. And in this page Kate Christensen has captured a whole year's worth of gratitude, broken down by family member. I hope what you've taken away from these beautiful layouts of gratitude is that it's never too late to express your gratitude...in your thoughts, in your words, in your actions or in your scrapbook pages. I hope you all had a lovely Thanksgiving Holiday! My Thanksgiving morning will begin fairly early as I start preparing our family's meal. My boys and husband will pop in periodically inquiring as to when everything will be ready, as I run around the kitchen like a mad person trying to keep on top of everything. And after I inevitably overcook our Turkey, make the most creamy mashed potatoes my husband has ever tasted and serve my famous raspberry white chocolate cheesecake, there will be the biggest pile of dishes I have ever seen waiting for me in the sink. But the dishes will remain there for just a while longer, because the minute we finish eating, my oldest son will insist that we go pick out our Christmas tree--a Thanksgiving Day tradition of ours since before our boys were even born. We will drive to the grocer just minutes from our house, whose selection of trees is both beautiful AND affordable. We will pick out our tree and tie it to the top of our car and bring it home. We will likely end up cutting the top off it as we do most years because we have grossly overestimated the height of our living room. Once the tree is up and the boys have resumed their play, my husband will reluctantly step away from his football game and take pity on me, as he joins me in the kitchen to help me finish the dishes. This is the story of my Thanksgiving...what does your Thanksgiving Day look like and how will you capture it in your scrapbook pages? Will you document your food prep activities throughout the day? Here I've recorded a photo and the recipe for the first pie I ever made, which happened to be for our 2012 Thanksgiving Day dinner. This was a quick photo I snapped before everyone sat down to the Collard Family Thanksgiving in 2010. It was nice to focus on a few of the special touches that are sure to go unnoticed once everyone sits down to eat. Do you have a special family tradition that you repeat year after year? My page "This is my Thanksgiving..." includes my Thanksgiving story that I shared above and photos from throughout our 2012 Thanksgiving Day. Laura O'Donnell's Project Life spead from the week of Thanksgiving 2012 also provides a good overview of her family's day. My hope is that in reading my Thanksgiving Day story and browsing these Thanksgiving Day pages you will become inspired to tell your own Thanksgiving Day story in your scrapbook pages. Whether you aim to document it in its entirety or just to record snapshots of this special day, challenge yourself to answer the question, "What does my Thanksgiving Day look like?" in your next page! I hope you all have a lovely Thanksgiving holiday!